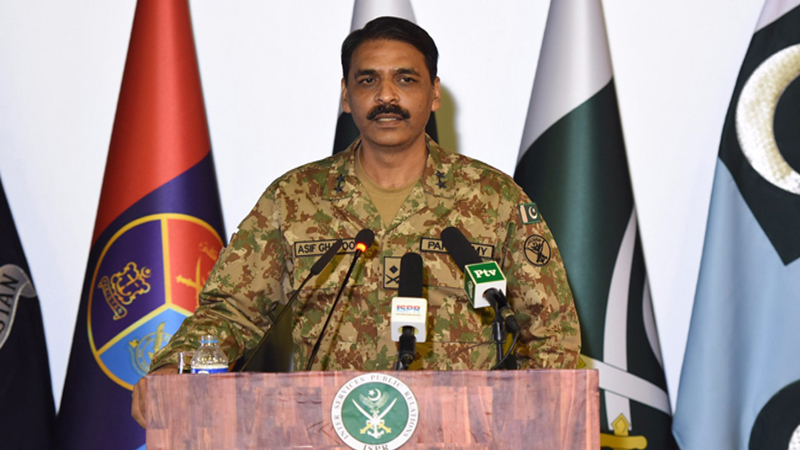 ISLAMABAD/LAHORE: Responding to the Indian army chief’s ‘nuclear bluff’ assertion, Maj Gen Asif Ghafoor on Saturday said that such irresponsible statements from a person of a responsible stature are deplorable. He further said that if India could overpower Pakistan through conventional engagement post-overt nuclearisation, it could have done that by now. “The only thing stopping them is our credible nuclear deterrence as there is no space of war between the two nuclear states,” he said. “That’s why they are targeting us through sub-conventional threat and state-sponsored terrorism,” he said, adding, “But they have failed on this account as well. “We are a professional army, responsible nuclear state and resilient nation,” the DG ISPR said. “They must not remain in illusion,” he warned. Getting in on the act, the Foreign Office also responded to the Indian army chief’s statement in strong terms, saying Gen Rawat’s “threatening” remark is “representative of a sinister mindset that has taken hold of India”. “These are not issues to be taken lightly. There must not be any misadventure based on [a] miscalculation,” FO spokesman Dr Mohammad Faisal said in a statement. “Pakistan is fully capable of defending itself,” he said. Meanwhile, Foreign Minister Khawaja Asif said that India may test Pakistan’s resolve if that is what it wishes to do. Earlier on Friday, India’s Army Chief General Bipin Rawat said the force was ready to call Pakistan’s “nuclear bluff” and cross the border to carry out any operation if asked by the New Delhi government. “We will call the [nuclear] bluff of Pakistan. If we will have to really confront the Pakistanis, and a task is given to us, we are not going to say we cannot cross the border because they have nuclear weapons. We will have to call their nuclear bluff,” he added. He was responding to a question during a press conference on the possibility of Pakistan using its nuclear weapons in case the situation along the border deteriorates. To another question, he said India and the US were deliberating on a proposal to appoint military liaison officers at each other’s combatant commands. “We are examining various dimensions of the proposal,” he said. Moreover, he said a hotline will be set up between the Indian and Chinese armies very soon. “It is moving very fast. Very soon we will have a hotline with the Chinese side,” he said. He said both India and China were very keen on having a hotline between the Indian Army’s Director General of Military Operations (DGMO) and the Chinese officer holding similar position. The Indian Army chief said a hotline will help resolve incidents such as transgressions along the border promptly. “We are very keen to start the hotline. The Chinese are also very clear,” he said. It is crucial to note that, currently, India and Pakistan have a hotline between their DGMOs. Haha…jokers of Pakistan..only fools in Pakistan can even think of competing with India. Pakistan, even if it shows the intent India will you off. Khwaja…allah allah kartey reh jaogey tab. Hindus are cowards, they welcomed all who conquered them. I’m an Indian and something is not ok about your comment. What prevented us from finishing Pakistan if they only had toys and not nuclear bombs? All remember Kargil Misadventure and Musharraf’s Nuclear Card, when NLI & Pak soldiers were trapped on peaks for want of safe passage to retreat? Clinton in her interview clearly stated that Pakistan at that time desperately played Nuclear Card for safe passage for its soldiers. Remember 4July1999 Accord when Sharif had to plead the issue in USA and agreed to withdraw Jokers from every inch Indian Controlled side of LOC. The Mulla Brigade (UJC) rejected plan but ultimately had to lick their wounds. Remember why 26July is celebrated by Indian forces as VIJAY DIWAS. Pakistan was caught its pent down. For last three decades Jungle has enjoyed threatening the world on this Nuclear Bluff. The times have changed and the Boots can’t play this card anymore. The technology is changed, the world is changed and situation has further deteriorated the Jungle ecosystem and economy. Watch how the Boots may again lick their wounds and be on their knees. 2018 is crucial for Pakistan to take right decisions. They have fingered us so many times. If its all bluff, why did we not eradicate them so far? Why all these comments from Daal Eaters? Bring it on Modi and you will not be alive to see the disintegration of your country. Guys, let’s not play this ike a cricket match, because here both parties will lose and the winner will be the puppet master. I wish we had mature leaders both sides and not morons instigating fight to brag who has more strength. It’ll be a great loss on both ends, and beyond.